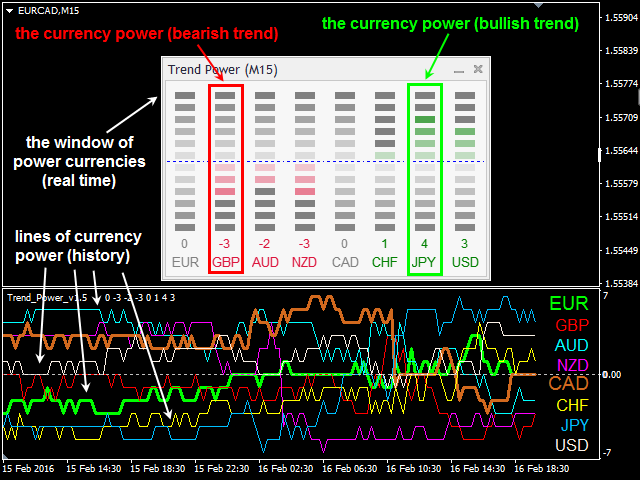 A very powerful tool that analyzes the direction and the strength of the 8 major currencies: EUR, GBP, AUD, NZD, CAD, CHF, JPY, USD – both in real time, and on historical data. 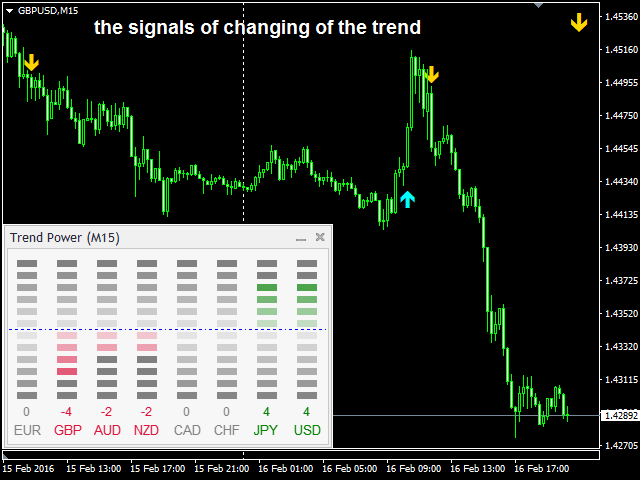 The indicator generates a sound signal and a message when a trend changes. The strength of the signal is calculated for all pairs which include these currencies (28 pairs total), can have value from 0 to 6 on a bullish trend, and from 0 to -6 on a bearish trend. Thus, you will never miss a good movement. 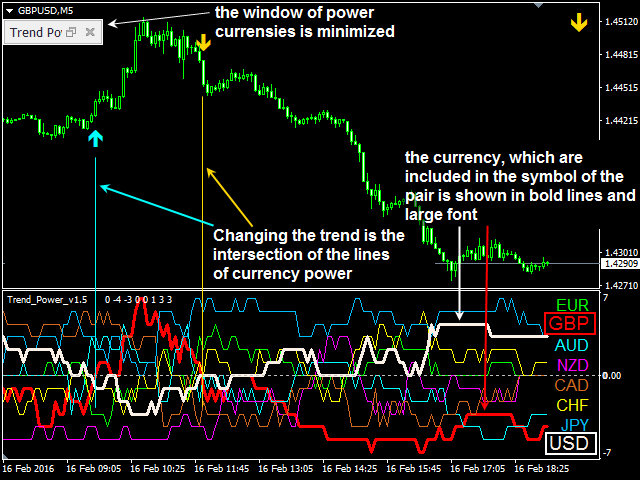 By placing the indicator on a chart of one currency pair, you will be monitoring the trend of all 28 instruments. 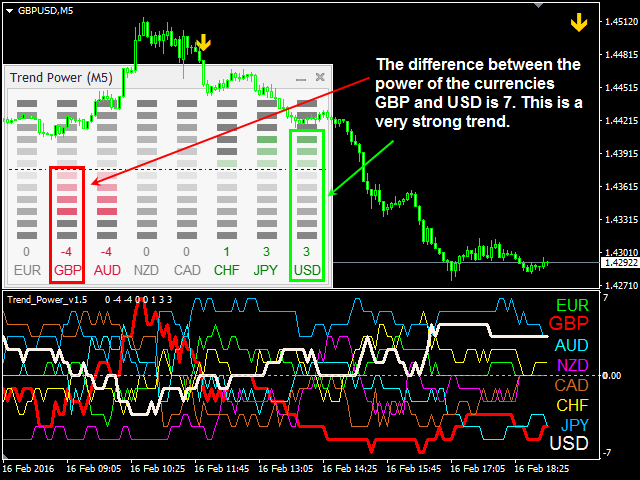 This Demo version of the "Trend Power" indicator is fully functional on GBPUSD (history + real time + signals). Signals on other instruments can be seen on the history (20 bars from the current one). 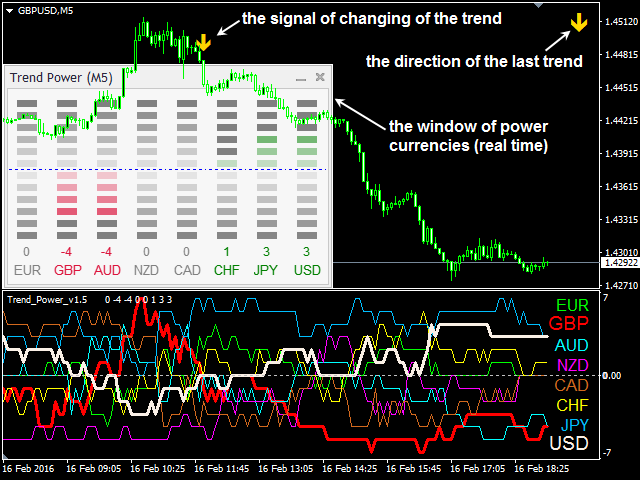 The current strength of the trend is not monitored on the other instruments and is deleted from the window 1 minute after the indicator loads. 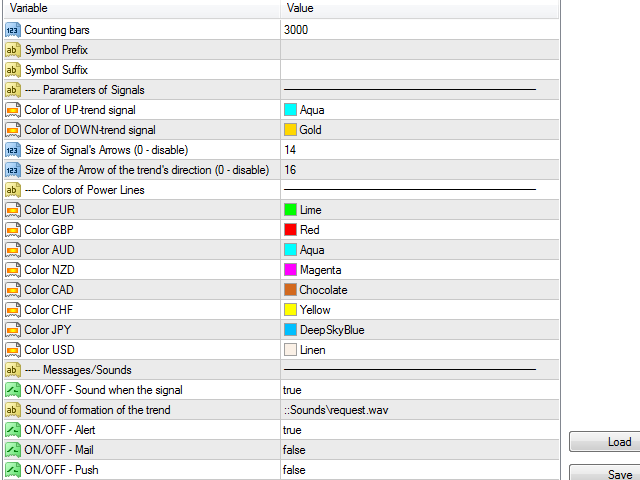 Full version of the indicator and description of the features is here. The greater the difference between the two currencies, the stronger the trend of the currency pair that includes these currencies. Signal of intersection of the strength lines of two currencies - a signal of trend change. It allows to take a large portion of the trend, but false entries are possible when the market is in a flat or when it has rapid price fluctuations. It is recommended to wait for the rollback for confirmation. By current readings of the strength, without using a signal (more reliable method). In the current strength window find the strongest currency (the greatest positive value of the trend strength) and the weakest currency (the greatest negative value of the trend strength). As a rule, the instrument including these currencies is in a very strong trend. It is necessary to wait for the correction to enter. 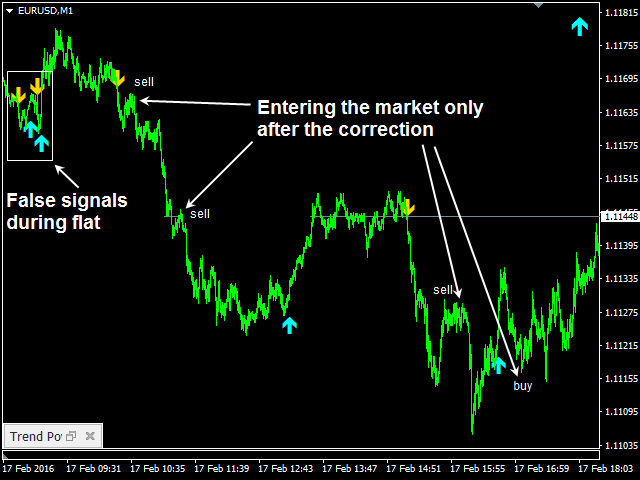 The indicator signals should not be directly used for market entries! As a rule, a strong trend will have already developed by the time a signal appears, therefore it is necessary to wait for the rollback and enter the market at the current or smaller timeframe based on the data from the other indicators, for example Trend Monitor. It is important to have complete historical data on 28 currency pairs, otherwise the indicator readings will be incorrect! The indicator is able to download the historical data on its own. But it takes considerable time (up to 3 minutes, depending on the download speed). Therefore, to improve the indicator operation speed and to correctly display the data, it is recommended to run the free script «Download Quotes» before the first launch of the indicator, which automatically connects the instruments to the MarketWatch window of the terminal and downloads the historical data on all 28 currency pairs for all timeframes. This procedure needs to be done only once before the first launch of the indicator. This indicator is very slow with it's signal and heavy on CPU usage! Fixed an unfortunate typo, which caused no signals to be available in real-time. 1. Updated calculation algorithm. The indicator now shows trend more stably, it does not react to minor movements. =3 - low sensitivity, minimum of false signals, can be lagging (good for M1). 3. The indicator determines trend: if difference in currency strengths is below "Signal Threshold" - the current instrument is in flat. 4. The indicator shows the market state for the current instrument (trend/flat) using colored bars at the top of the subwindow. Fixed a bug that prevented the indicator from calculating the history further than 2 000 bars. Now, the maximum number of bars for the calculation is 10 000. As the indicator processes 28 currency pairs simultaneously, during the calculation of a significant number of bars the indicator may freeze for 1-3 seconds to initialize.